Unfortunately too many people carry the “I want it now” mentality that our society has grown accustomed to over to P90X. I cannot tell you how many times people have emailed me complaining about why they are not seeing results with P90X in the first 30 days. Many give up because of this. What you need to know is the real results don’t start rolling in until day 45. But there are some things you can do to make sure you start seeing results in the first month and this is what I’ve found people are not doing to get them. Lots of people get P90X and did not read the P90X Workout Guidebook which explains how to do all 90 days. What ends up happening is they only get through each workout maybe two times in the first 30 days and that’s assuming they don’t miss a day. Doing it that way won’t challenge the muscle groups targeted in month 1 of the Lean, Classic, or Doubles routine. Take the time to go through all of the materials and read what Beachbody and Tony Horton have put together. My recommendation is to start with the P90X Classic routine and stick with it. This is probably the biggest reason why you’re not seeing results. This is also the one I struggled with in my first round of P90X. 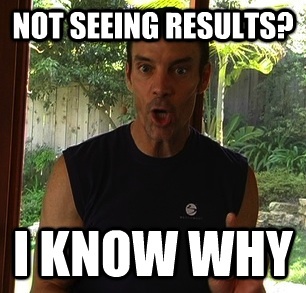 Tony Horton has said over 70% of your results will come from eating correctly. Still eating fast food, junk food, having that 500 calorie Starbucks coffee in the morning, and the daily Pepsi / Mountain Dew? Those things are hindering your results no matter how hard you work out. You might feel stronger but can’t see the changes in the mirror yet and its because of those foods / drinks. I fell into the category of being in shape before and ate well 75% of the time which made seeing the definition a little harder in those first 30 days. Shakeology helped a lot and it’s why I’ve been buying the stuff every month since it came out in 2010. Don’t think you’re going to get the P90X results you see from people on the infomercials, YouTube videos, or on other websites if you’re working out 3 days or less a week. I’m sorry, it’s not going to happen. You might see some small changes and feel a little healthier but you are not going to have dramatic life changing results in 90 days working out 36 times in 90 days. You missed 54 workouts. How are you going to burn the fat or build muscle if you’re not showing up? Better to miss one or two days a week when you planned for 6 than miss one or two when you planned for three days. The P90X nutrition plan is something that you can make dramatic changes with by sitting down at your dinner table for an hour and writing down a shopping list of things to buy for the next week. If you have good food around the house you’ll start eating good food when your at work or out and about. Working out is different because it forces you to do something you otherwise might not want to do. Make a habit of working out 5-7 hours a week and that 1 hour of writing down what to eat next week won’t seem like a big deal. These are the 3 biggest reasons why people don’t see results in their first 30 days of P90X. If this sounds like you then you know what you need to do.